Sligo Yacht club hosted the J24 Northern Championship last weekend on the beautiful shores of Rosses Point. The 19 boat fleet was the largest in the recent history of the class and this made for excellent racing. 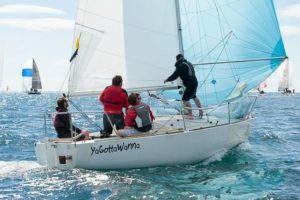 Saturday saw light and shifty wind, peppered with showers and the occasional 20 knot squall, making the racecourse extremely challenging for the competitors who travelled from all over Ireland. Four races were completed on Saturday but shifting winds caused several delays as the windward/leeward course was reset before each start. RCYC boat “YaGottaWanna” lost a spinnaker halyard during race one, but managed to do the necessary repairs in time to complete the day. Sunday racing saw a different set of skills needed as the fleet contended with difficult wind shifts and strong tides. Although winds were 11 to 17 knots with high gusts a number of the J’s went with genoa while others changed down to a jib. Team Irelands Eye Kilcullen gave an unrivalled display of consistency, never dropping out of the top three in any race and wrapping up the championship early on Sunday morning clinching gold fleet glory with a race to spare. The team were pushed hard by JP McCauldin on Jamais Encore and the unstoppable, ever present Flor O’Driscoll, helming the famous “Hard on Port” just months after suffering a stroke, a truly inspiring performance. Silver fleet was won by Steve Atkinson and his crew from Carrickfergus on “Bad” with YaGottaWanna in second, ending the regatta in a creditable 7th place in the 19 boat fleet. The J24 fleet will be coming to the RCYC for the Southern Championship on July 2nd and 3rd. As most of the fleet are based upcountry, numbers will be lower than the Sligo entry, so if anyone knows a J24 owner, use all your powers of persuasion to encourage them to our beautiful coast.